Whether you’ve been following for five years or five minutes (also, can you believe I’ve been blogging for EIGHT years now?! ), you likely know of my obsession with the royal family! In the fall I launched a new site, Sussex Style Watch, dedicated to recreating Meghan Markle’s outfits (Kate’s too!) at a variety of price points. I also share the latest in royal gossip, news and other exciting updates happening in and around the royal family! It’s been really fun creating the content for that site, so I hope you’ll take a minute and check it out – you can also follow Sussex Style Watch on Instagram. I’m trying to reach 10k followers so I can start using the “swipe up” feature and share her looks in real time! In addition to that, I have definitely been “influenced” by Meghan in my own style choices. Sure, not all of her outfits are winners (fit seems to be her main problem), but she and I both seem to favor classic, neutral wardrobe staples. In general, I like what she chooses and have actually acquired a number of pieces based on things she has worn! I especially love her handbag and shoe choices – this girl LOVES her shoes! Anyway, I thought it might be fun to recreate some of her more relatable looks using pieces I already own. I chose three very neutral outfits she’s worn in the last year – two from her recent Royal Tour and the third from her visit to Brixton last year around this time. Each look is polished and comfortable, making them all great options for a more casual office environment, travel or weekend wear! In the titles above each outfit, I’ve linked back to the Sussex Style Watch pages where you can shop her exact looks. I hope you enjoy this royal-inspired post! I was thinking it could be cool to do this as a series – every month sharing a few new Meghan-inspired looks and how her royal style translates into my real life wardrobe… let me know if you like that idea in the comments section at the bottom of this page!! I actually picked up the coat I’m wearing here during the Nordstrom Anniversary Sale this summer, and realized how similar it looked to Meghan’s when I did this post on her outfit last week. It’s got that same neutral stone shade going on, and a similar collar situation happening. It lacks the black buttons and jetted pockets Meghan’s Smythe coat has, but you get the idea! 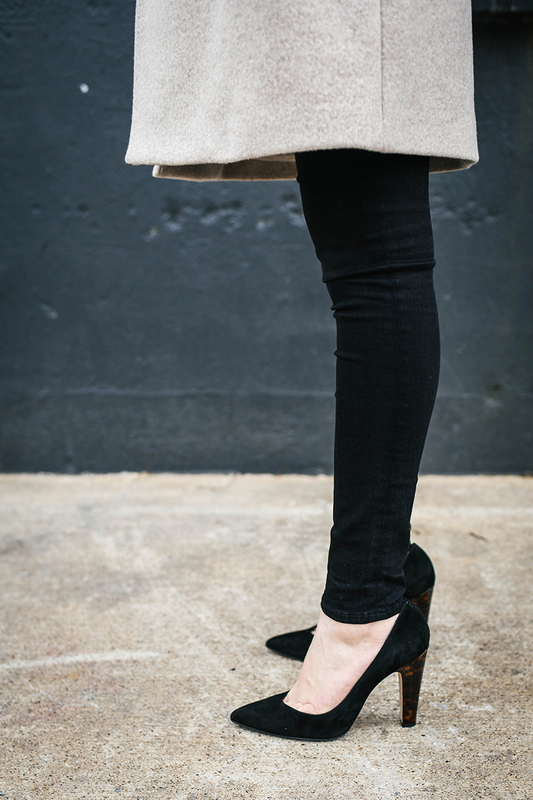 She styled her coat with a black sweater, black wide leg pants, a scarf to match the coat, and these Sarah Flint heels. Because I don’t work at a corporate office, I don’t own many styles of trousers – that includes wide leg black pants. So to make this look more “me”, I swapped the wide leg pant look for my favorite black skinny jeans! I also didn’t have a scarf that matched the coat, but I did have a black one. Sarah Flint sent me Meghan’s Jay pumps last month, so luckily I was able to match her exact shoes to recreate this look! If you are trying to recreate this look with pieces in your own wardrobe, just style it with your favorite pair of pointy-toe black pumps… you also might consider grabbing a handbag that matches the coat to keep the color theme going! This look is classic and super cozy for winter wear. This trench I’m wearing here is from like a decade ago! It’s by Burberry, and I believe my grandmother bought it for me when I was in college. I was also watching Gossip Girl last week and saw Blake Lively wearing it in an earlier episode, which made me laugh… It was definitely from that long ago!!! While it doesn’t have the exact same color scheme as Meghan’s checked trench by Karen Walker, it features practically the same silhouette and a comparable print going on. I linked a few similar check print trench styles below for you to recreate the look yourself! The dress I’m wearing is from Tibi, also from a few years ago – I wore it first in April 2015 here! Pieces like this simple black dress are ones I hold onto forrreeeevvveeerrrr. You just never know when you’ll need something like it, it can be worn for a variety of occasions, and it can be styled a hundred different ways! I thought it looked like a good match-up to Meghan’s black dress she wore with her trench when touching down in Wellington, New Zealand. Finally, I topped it off with the Sarah Flint Jay pumps again as Meghan did. Throw on a sleek tote and you’ve got a chic, work-friendly outfit! This look is totally one I’ve worn before and will wear again and again. Meghan wore a nearly identical outfit while in Wellington, New Zealand on the royal tour back in October. The drape-neck trench she is wearing is an old style by Club Monaco (a favorite label of us both! ), and I have it in two colors… I also have a very similar style from three years ago that I just can’t seem to part with – even though it’s got a grease stain on it. Needless to say my obsession with drape-neck trenches was engrained in me long before Meghan arrived on my royal radar! She paired her trench with a simple black turtleneck, black skinny jeans, and a very cool pair of lace-up boots by Stuart Weitzman (still available here!). While I don’t have lace-up boots, I do have a taller pair of black boots by Isabel Marant from a few years ago that mirror the look pretty well. I am obsessed with Meghan Markle’s style! These outfits are gorgeous!! Love anything Royals-related! Kate is my fave, but it is fun to have another female on the scene to drool over outfits. 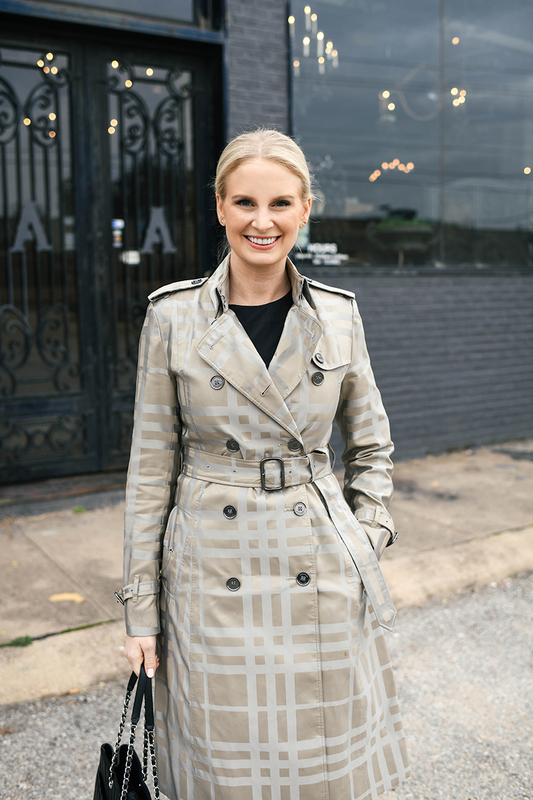 Sometimes I wish I lived somewhere a little colder since I wouldn’t get much bang for my buck with an extensive coat collection in Alabama : / You look fab and classy in all these looks! Who makes the gorgeous purse that you carry in all of these photos! I love it. It’s by Gabriela Hearst, but unfortunately it’s not available for purchase online. You can read more about it here! Love this concept! 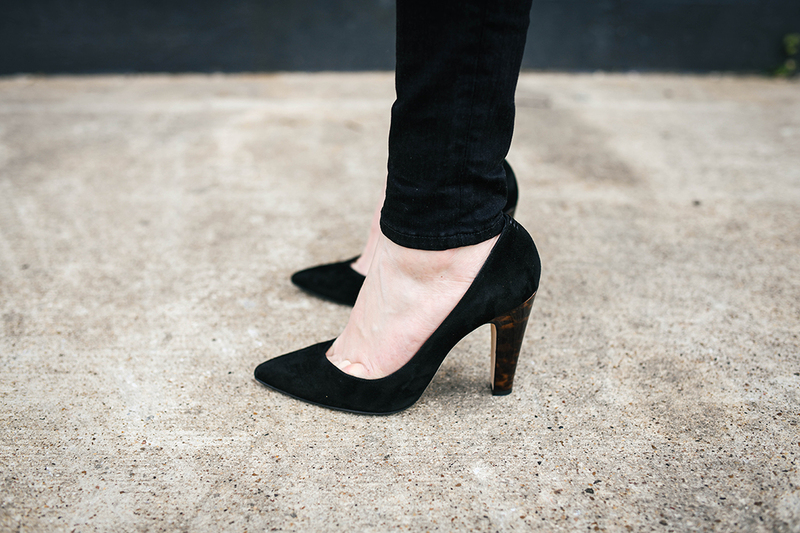 Those Sarah Flint heels are stunning! Putting those on my wish list. What is the coat you are wearing in the MEGHAN’S VISIT TO BRIXTON segment. Thanks for all your style help! It is so great. Thanks for reaching out! As it mentions in the text below the photos, that coat is a Theory style I picked up during the Nordstrom Anniversary Sale last summer. Unfortunately it is no longer available. Sorry! !